When President’s weekend and the glimmer of the Easter season arrives, I immediately start to break out all my flavorful grilling recipes and head to the outdoors. 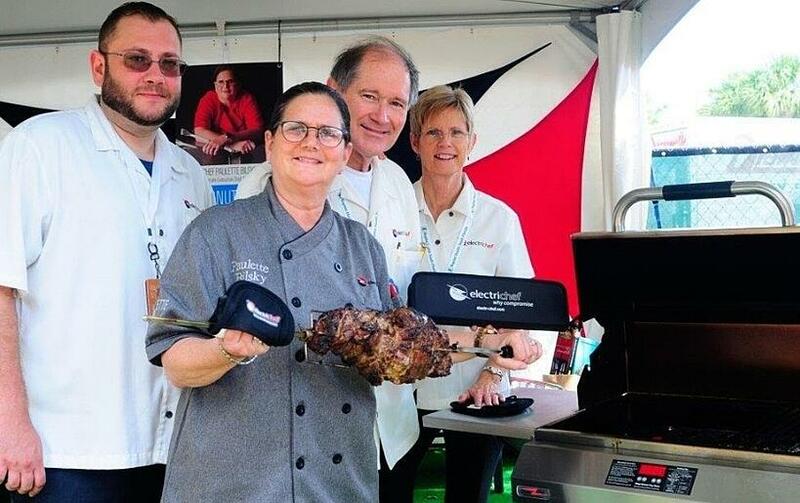 One of my most favorite recipes, grilled leg of lamb, came to mind when planning ElectriChef’s sponsorship at the 2017 Coconut Grove Arts Festival. This year my goal was to introduce the CGAF audience to the flavorful techniques of electric rotisserie grilling lamb on my ElectriChef Outdoor Electric Grill. 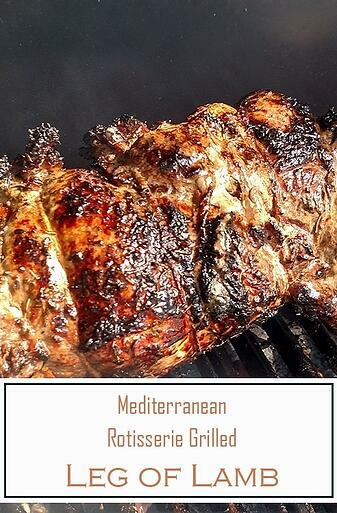 I knew right away there would be “lamb haters”, but this just inspired me, even more, to create grilled lamb recipes that were not only delicious but easy, flavorful and a proven crowd pleaser when made for my Easter holiday festivities. American lamb is 10,000 miles fresher! Family farmers and ranchers raise sheep in nearly every state in the U.S., making fresh, local lamb available wherever you are. No artificial growth hormones are used in lamb production in the United States. I feel the advancement of the lamb industry is the first thing lamb lovers and “lamb haters” should understand before attempting to grill lamb. Once this information is understood, I have been able to dazzle the average griller with the impressive presentation of the rotisserie leg of lamb. 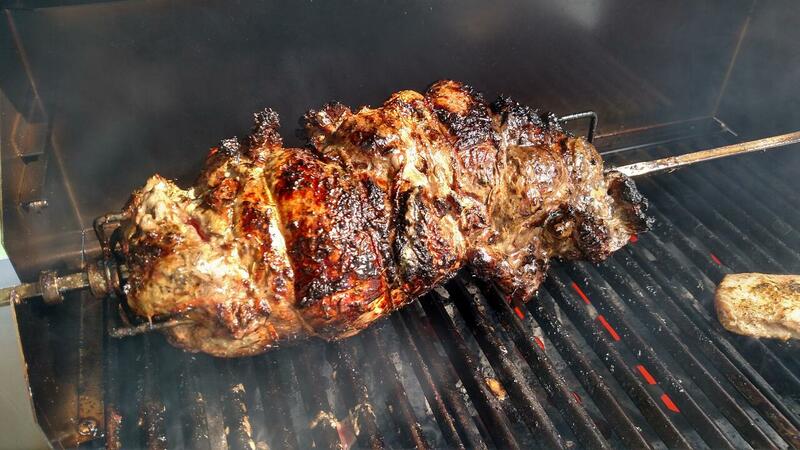 Preparing a leg of lamb cannot be any easier when using a rotisserie. This grilling technique is known to be one of the oldest cooking methods in the world. Historians have placed a significant religious consideration as to why we cook lamb during the Easter season. Even the Pope adopted roasting a whole lamb for his Easter dinner. I chose to grill a lamb's leg at the CGAF because many people would like to continue this tradition, and the festival comes at a time just before the Easter season. My plan was to incorporate the multi-cultural food environment in Miami. My first recipe at the festival was to keep the traditional Greek Easter rotisserie style lamb's leg. Cut excess fat from the leg. If you have the butcher truss*¹ the lamb, ask them to remove excess fat before trussing. Place the lamb, trussed, on a large ceramic plate or cutting board. Press garlic cloves into the lamb either by placing small slits in the lamb or just pushing them inside the center in a few areas. Mix lemon juice and oil in a small bowl, drizzle the mixture over the leg, then gently massage the lamb to make sure the oil and lemon have covered the lamb entirely. Sprinkle Kosher salt, pepper, mint, and Italian seasoning evenly all over lamb. Again, massage the lamb to make sure you have covered it entirely. Place lamb into a 2-gallon resealable plastic bag and add Greek yogurt. After closing the bag, gently massage lamb again to completely cover with yogurt. Place in refrigerator at least 1-2 hours. Pro Tip: Lamb can stay in refrigerator overnight, however, the exterior of the lamb may appear to be gray in color. This is perfectly fine if the lamb has been refrigerated properly the entire time. Remove from refrigerator and allow to reach room temperature, about 30 minutes. Remove two of the grill racks on the left side of your ElectriChef Electric Grill. Set the grill temperature to 550ºF degrees and prepare the rotisserie accessories. Just prior to placing lamb on the rotisserie skewer spit*³ wipe away excess yogurt from the lamb. Leave some of the yogurt, but remove enough to prevent dripping. Discard the plastic bag and leftover yogurt. Place lamb just left of center on the rotisserie skewer or spit making sure it is balanced and secure. Pro Tip: By putting the lamb in this location, you have allowed room on the right third of the grill to place other food on the grates while the lamb is on the rotisserie, if desired. Turn on the rotisserie and close the lid of the grill for about 15 minutes checking occasionally for flare ups due to dripping juices. If flare-ups occur too often, carefully use a water spray bottle or pour a small amount of water on the flare up. Removing excess fat from the lamb will help minimize flare ups. The flare ups will help create a flavorful crispy crust on your lamb, but it should not be overly charred. After about 15 minutes or desired exterior crust on your lamb, reduce the Electric Grill temperature to 425ºF degrees. Grill for an estimated 40 minutes to 1 hour additional cooking time depending on your preference of internal temperature. Medium rare: 145ºF; Medium: 160ºF; Well-done: 170ºF. Pro Tip: The internal temperature of the lamb will increase during the resting period so make sure you move the lamb from the grill 5-7 degrees below the desired temperature. Allow lamb to rest*⁴ for 10-20 minutes and remove the trussing prior to slicing. Trussing*¹ is the process of taking butcher’s twine and tying meat such as lamb. The purpose of tying the meat is to keep it in a uniform shape, which helps it cook evenly. Zest*² is prepared by scraping or cutting from the outer, colorful skin of unwaxed citrus fruits such as lemon, orange, citron, and lime. 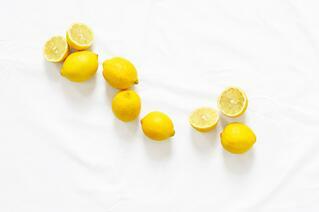 Zest is used to add flavor ("zest") to foods. A spit*³ is a long solid rod used to hold food while it is being cooked over a fire in a fireplace or over a grill. This method is generally used for cooking large joints of meat, such as a lamb's leg. In medieval and early modern kitchens, the spit was the preferred way of cooking meat in a large household. If given the time to rest*⁴ the meat will lose less juice when you cut it, resulting in a juicier and tastier cut of meat. The time taken to rest will depend on its size, but the lamb's leg is best rested for 10 to 20 minutes before carving. Steaks or chops should stand for 5 minutes (but no less than 3) before serving. What's Next? Subscribe to the blog to be updated when part two of the Lamb Lovers Unite Blog is Posted!